You was born in 1976 and is a native of Zhangzhou city, Fujian province. 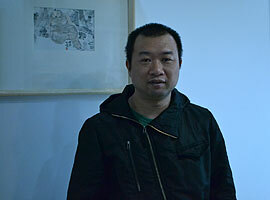 He was graduated from Jimei University, Xiamen in 2001 and since then, You has become a contemporary artist, a poet and a writer. He used to call himself a poet-painter. “My paintings are all visual presentation of the scripts in my poems. My poems are expressions of my knowledge about this world and things happened around me,” said You. “My latest creation – the Franz Kafka series, in memory of the late Czech novelist of the twentieth century is relentlessly, a reflection of me and today’s world,” added You. You was awarded at the The Nanjing International Art Exhibition 2015 and subsequently in May 2016, he held his first solo exhibition in Quanzhou, Fujian province. Currently residing in Hangzhou city, You is specialized in contemporary Chinese ink wash painting. Many of You’s artworks were acquired by institutions and private collectors in China.